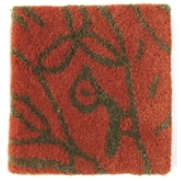 Nanimarquina, Bichos y Flores carpet orange: Pistachio, pink, orange or red colours for a collection of rugs with drawings on them, designed by Javier Mariscal. Nanimarquina, Bichos y Flores carpet orange: Pistachio, pink, orange or red colours for a collection of rugs with drawings on them, designed by Javier Mariscal. The unique impression represented by its design is revealed through a universe of naïve beings that inhabit its surface. Characters from a very personal story that fire the imagination of the youngest members of the home, sharing their games. Shapes that add an informal touch to the most carefree environments for the child inside us all. Its circular format makes this piece a versatile element for any room, whether it's a child's or not.